BOTTLED DRINK Vending Machine Suppliers. Please contact these bottle vending machine suppliers direct for more information about their BOTTLE Drink Vending Machines and pricing. Also See: Vending Machine Manufacturers, Distributors, Soda, Snack, Cold Food, Glassfront, Milk, Deli Sandwich machines. 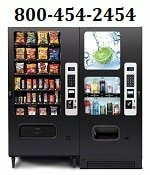 MonsterVending.com sells completely refurbished vending machines; Bottle, Can, Energy, Snack, Coffee, Refrigerated Snack, Frozen, Food, Ice Cream, dollar bill change and Coffee machines. We carry a large selection of parts for Vending Machines, We ship USA. Order online or come in to visit our showroom based in La Habra, California. for Parts, or Prices call 1-909-223-5522 today!